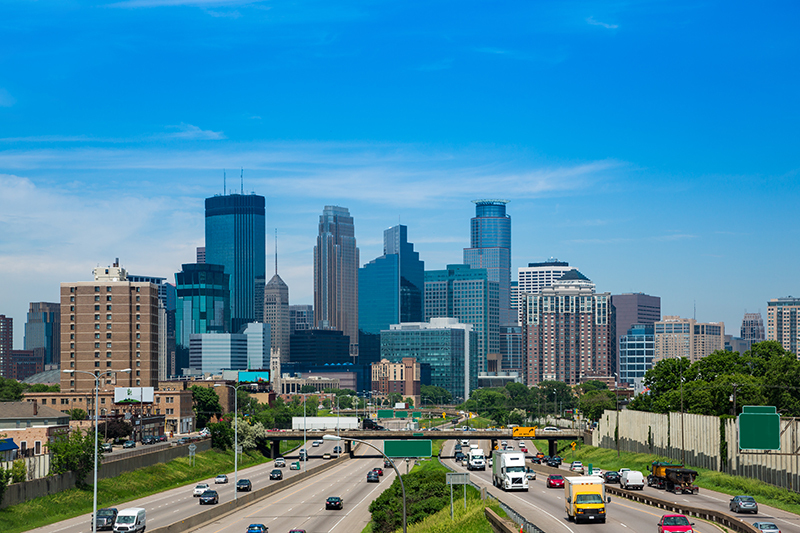 Are you considering moving to one of the Twin Cities and worried about the commute? Don’t fret, Minneapolis and St. Paul are wonderful places to live and work with significantly lower commute times than other large cities in the United States. In fact, Minnesota workers have an average daily commute time of 22.1 minutes, which is shorter than the national average. The commute time for those living in Minneapolis is even shorter at 21.7 minutes. If you’re moving from cities like Los Angeles, the commute for Minneapolis to St. Paul will seem like a breeze. Plus, living in the heart of one of these beautiful cities means being within walking distance to nightlife, museums and more. The best time to travel between cities depends on where you’re coming from. Traffic tends to be slightly worse coming to and from the suburbs of the cities, however, there are ways to plan around traffic and save time. According to TripSavvy, the morning rush hour is earlier between cities and will be at its worst around 7:30 to 8:30 a.m. The evening rush hour starts decently early at around 4 p.m. and peaks at 5 to 5:30 p.m. If you plan to leave for work around 7 a.m. and go home after 5:30, you could shave about 20 minutes each day to your commute. The drive between St. Paul and Minneapolis is about 20 minutes without traffic, however, in rush hour you could expect that to double. Keep an eye out for large events in either cities, as that will make the commute even longer. If driving isn’t your thing, check out the METRO Transit Line, which will get you between the two cities in about 45 minutes. Most take the green line, however, there are lines that branch between the two cities. Snowy days in the Twin Cities can be beautiful, especially when you know how to drive in them. The commute between Minneapolis and St. Paul can get more backed up in the winter when more drivers are other the road rather than biking and walking. Allow extra time on your commute for traffic due to weather. It’s also important that you make sure your car is completely clear from snow before driving on the highway or any roads. It can be dangerous to yourself and other drivers to have snow and ice on your vehicle. You should also be sure to listen to local weather and check the conditions before. It may be faster to take the light rail or leave at a different time if the weather isn’t great. Snowy days in “The North Star State” lead to a green and flourishing spring and winter. Plus, who doesn’t love snowshoeing and ice fishing then snuggling up to a fireplace with a cup of hot cocoa. The vehicle that you’re driving can make or break your commute. A sports car is not an optimal vehicle for winter months. And although the drive between Minneapolis and St. Paul isn’t too long, having amenities in your car can be a game changer. Look for vehicles that are meant for driving in all weather conditions, rain, snow or sunshine. Finding a car that is both fuel efficient and weather-proof will make your commute between the Twin Cities effortless. If you’re spending nearly an hour in your car each day, you might as well be enjoying it! Download an audiobook and put it on your Bluetooth speakers in your car. This is a great way to catch up on your reading list and avoid road rage. You can also get audiobooks to learn a new language, making your daily commute even more efficient. Moving to the Twin Cities comes with a variety of outdoor activities, friendly neighbors and more. With over three and a half million residents between the two cities and growing, you will never be bored. Be sure to check out the Minneapolis Sculpture Garden, Como Park and Conservatory and Fort Snelling State Park, just a few of the places you can visit on the weekends to escape to nature and refresh. Of course, tourists and locals alike need to make (a few) stops to the Mall of America and see what it’s all about. Commuting between the Twin Cities is easy as long as you are prepared with the right vehicle and keep an eye on the weather. No one likes sitting and traffic, and hopefully these tips made you hopeful that the commute between the Twin Cities is worth it. For more help on relocating, check out our relocation guide!